" We also do the same thing at nine points of tree today"
To prevent fallen tree and make the place more beautiful, the Central Jakarta Forestry Sub-dept. 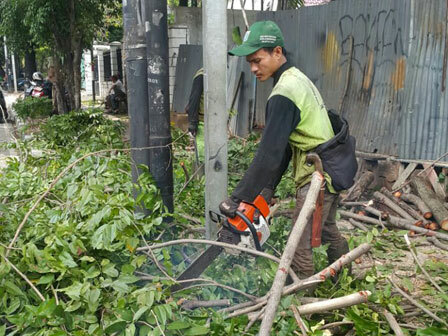 today began to conduct tree pruning simultaneously in 12 parks in Central Jakarta. "We also do the same thing at nine points of tree today," expressed Sabdo Kurnianto, Head of Central Jakarta Forestry Dept., Tuesday (3/27). Those 12 parks are Situ Lembang Park, Menteng Park, Cilacap Park, Lawang Park, Kudus Park, Karawang Park, Suropati Park, Panarukan Park, Segitiga Cikini Park and Sawo Park. There are also triangle park on Jalan Industri and park on Jalan Tanah Abang Timur. "So each point is done by a team of seven officers. They are equipped with cutting tools to do their work faster," he stated.